Southeast Asian diplomats said Tuesday that China’s controversial island-building drive is raising regional tensions, with the Philippines slamming its “unilateral and aggressive activities”. The US and some Southeast Asian states have watched with growing alarm as Beijing expands tiny reefs in the South China Sea, topping some with military posts to reinforce its disputed claims over the strategic waters and fanning fears of future conflict. The flashpoint issue has taken centre stage at the annual security forum hosted by the 10-member Association of Southeast Asian Nations (ASEAN) that began Tuesday. But China has insisted it will not discuss the dispute during the meetings. That prompted a sharp rebuke from the Philippines, which along with Vietnam has been involved in the most direct territorial confrontations with China. “As we speak, we see no let-up on the unilateral and aggressive activities of our northern neighbour in the South China Sea,” Philippine Foreign Secretary Albert del Rosario told fellow ASEAN foreign ministers at an afternoon meeting, according to a transcript of his remarks obtained by AFP. He also hit out at what he described as “massive reclamation activities” and construction by Beijing in the disputed sea which had “undermined peace, security and stability”. 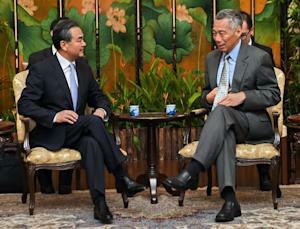 He reiterated China’s position that it would not bow to pressure on its land reclamation. But despite Beijing’s protestations, Malaysia’s foreign minister said the South China Sea disputes were “discussed extensively” during the day’s meetings. “We also discussed ways to address erosion of trust and confidence amongst parties following recent developments in the South China Sea, including land reclamation, as well as escalation of tension on the ground,” Anifah Aman told reporters. Beijing claims control over nearly all of the South China Sea, a key shipping route thought to hold rich oil and gas reserves. Beijing insists disputes must be handled on a bilateral basis between rival claimants. 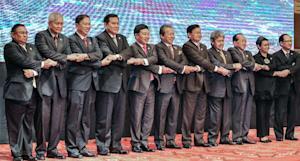 Diplomats and analysts say this stance is aimed at preventing ASEAN from presenting a more united front. But delegates say China will not be able to escape the issue in Kuala Lumpur this week. “This is not Cambodia or Laos,” one diplomat attending the talks told AFP, referring to a 2012 foreign ministers’ meeting in which host Cambodia — China’s ally — was accused of preventing discussion of it. Adding to the tensions, a Washington-based think tank said this week Beijing could be preparing to build a second airstrip on an artificial island. China is already building a 3,000-metre (10,000-foot) runway on Fiery Cross reef, which could ultimately be used for combat operations, according to the Center for Strategic and International Studies. Wang rejected calls by some rival claimants and the United States to suspend the land reclamation. “The freeze proposal may seem even-handed on the surface but it is actually unrealistic and will not work in practice,” he said. The talks will expand over the coming two days into the ASEAN Regional Forum (ARF), attended by US Secretary of State John Kerry, China’s Wang and envoys from the wider region including Japan, the Koreas, Russia and elsewhere. Kerry, who landed in Kuala Lumpur in the afternoon after a brief stopover in Singapore, is to meet Wang on Wednesday morning on the sidelines.